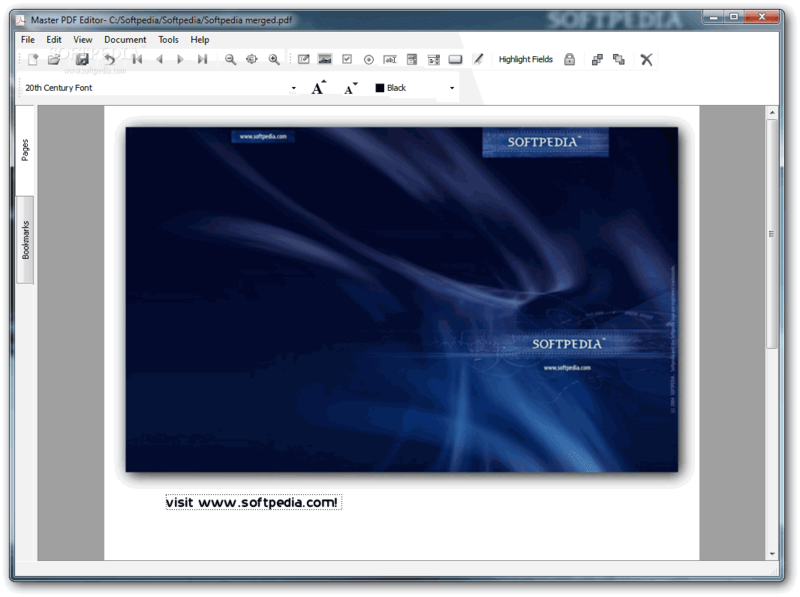 OpenOffice is a full-featured office suite that comes as a more affordable alternative to the popular Microsoft Office. OpenOffice brings alternative solutions for each major tool bundled into Microsoft's very own suite, which means that you can switch to this application even if you are a fan of MS Word, Excel, Power Point or Access. OpenOffice has them all, obviously under a different name, but boasting almost the same powerful functions as Microsoft’s software package. The installer allows you to select which components you wish to drop on your computer; OpenOffice lets you install only the things you need, so checking them twice before clicking them is highly recommended. Using OpenOffice is quite easy after you get used to the menus and the places functions are located. Sure, it might be a bit overwhelming for first-time users, but it’s only the way such a complex application may interact with its users. There are a lot of buttons everywhere you look, so it’s only a matter of time until you get used to it. "Writer" is a part of the suite designed as a direct replacement for Microsoft Word. It comes with spell checking, it allows you to insert tables, pictures, files or graphs into new documents, change formatting, build macros, switch to another language or even install extensions from the same rich interface. OpenOffice "Calc", Excel's equivalent, has everything you need, be it spreadsheet functions, filters, forms, charts and drawings. OpenOffice "Impress" component, on the other hand, challenges PowerPoint and relies on a wide assortment of built-in animations and effects to make your presentations more appealing. OpenOffice comprises all the necessary tools to become your office suite of choice. It is reliable, easy to use and runs very smooth, even on older computers. Installing Microsoft Office might seem a little tricky, since there are a lot of tools bundled into the installation kit, so computer knowledge can come in handy when trying to deploy a fresh copy of the software. Also, copying all files usually takes a while, even in the case of fast computers, since there are a lot of files that need to be transferred on the hard disks. Those who have not used an office suite before, be it Microsoft Office, Open Office or any other similar software, need to take the time to adjust to the interface. At the first glance, due to the well-known ribbon interface, the app might seem familiar. However, upon further analysis, one can find components or functions with every mouse click, and this might seem confusing if users do not know exactly the tool they require. Experimenting with the suite is necessary to ensure smooth operation in the future. Microsoft Office comes with several tools, as it follows: Excel, Outlook, PowerPoint, Word, Access, InfoPath, OneNote, Project, SharePoint Designer and Visio. Each of these can be installed separately or together with some other utilities that can make ease office work. Excel is ideal for creating spreadsheets and keeping track of one's finance, Outlook is the right tool to manage email, PowerPoint generates high-quality presentations, Word can be used to format and organize texts, Access is a database management system, InfoPath facilitates creation and distribution of electronic forms, whereas OneNote supports multi-user collaboration and Project, SharePoint Designer and Visio come in handy to developers. All the functions of Microsoft Office can be tested through the 60-day trial period, and if the results are satisfactory, a license needs to be purchased. Adobe Reader X is a powerful software solution that enables you to view and print PDF documents fast and easy, no matter the content, be it photos, videos, emails, drawings or any kind of multimedia file. The application allows you to write down comments and feedback using a separate frame in the right side of the window, while the reading space is not affected at all. In fact, this is one of this tool's strong points: the interface is quite clean, but still manages to provide a lot of tools for zooming, selecting text, print, add bookmarks and many others. A great thing about Adobe Reader X is its ability work with CAD designs and geospatial maps converted to Portable Document Format. Also, in case you need to locate any element within a PDF file, the application offers a comprehensive file searching engine that finds what you need in a matter of seconds. When it comes to customizing Adobe Reader X, the Preferences area will give you the possibility to modify a wide range of settings. Comments, 3D and multimedia, measuring and reading options are available, as well as spelling or page units configurations. In case you find Adobe Reader X too difficult to use, the application includes a comprehensive help manual. Unfortunately you will need an Internet connection to access it, which means you won't be able to read the documentation in offline mode. All things considered, with this software you can't get it wrong simply because it still sets the standards insofar as PDF documents are concerned. Adobe Reader X really works as advertised and is the leading tool for viewing Portable Document Format files. · Take advantage of the security of Protected Mode in Reader, which helps safeguard your computer software and data from malicious code. · Make notes and share your feedback with others by marking up PDF documents using the Sticky Notes and Highlighter tools. · View information more precisely and efficiently. Choose reading mode to fit more content on the screen or two-up mode to view page spreads. Use keyboard shortcuts like print, zoom, and find within the browser. · Find and retrieve any PDF document or phrase within a document in seconds. Search for words in page content, annotations, bookmarks, form fields, or document metadata within any PDF file on a local computer. · Open and view contents of a PDF Portfolio, a collection of PDF documents, and other document types, including drawings, email messages, spreadsheets, and videos. · Fill, save, sign, and electronically submit forms that have been Reader enabled by Adobe LiveCycle ES2 or Adobe Acrobat software. · Enable a new level of end-user interaction thanks to the ability of Reader to natively display rich media content created with Adobe Flash technology. · Reader users can access and interact with CAD designs and geospatial maps that have been converted to PDF. · View and interact with PDF files that contain a wide variety of content types, including drawings, email messages, spreadsheets, videos, and other multimedia elements. 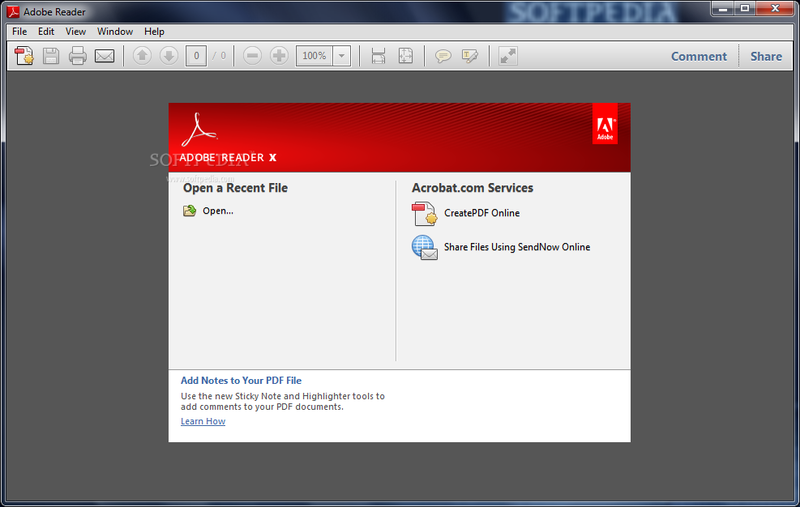 · Directly access online services at Acrobat.com from within Reader X. 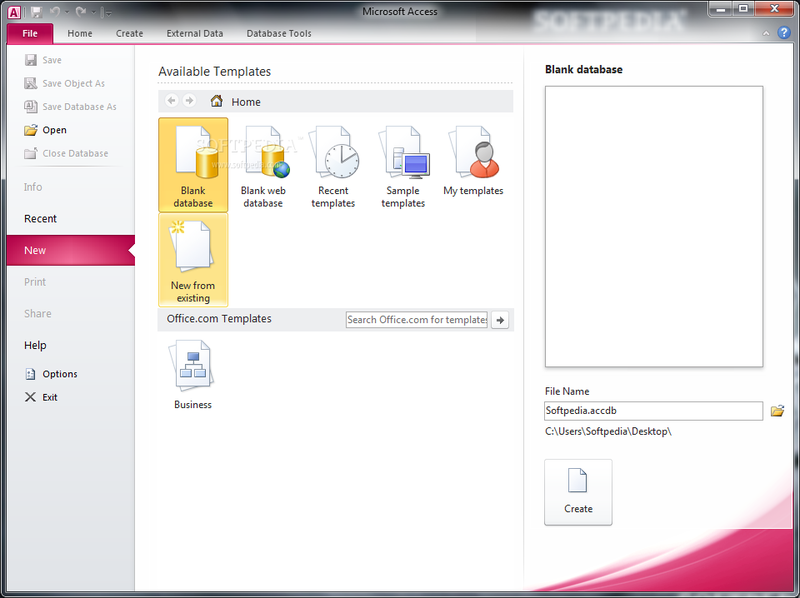 Perform common tasks such as creating PDF files, securely sharing and storing documents, and screen-sharing. · Take advantage of support for the new ISO Standard 32000 for PDF. Also, Reader continues to support PDF/A, the ISO-approved standard for the long-term preservation of electronic documents; PDF/X (printing); PDF/H; PDF/E (engineering); XMP/RDF; and ODBC. · Let Reader X read out loud, or change the reading order of columns. Reader meets the accessibility requirements mandated by Section 508 of the amended U.S. Rehabilitation Act. · Manage Reader deployments using the Adobe Customization Wizard, IBM Tivoli, Microsoft System Center Configuration Manager (SCCM), Microsoft System Center Updates Publisher (SCUP), Windows Group Policy Objects, or Active Directory. 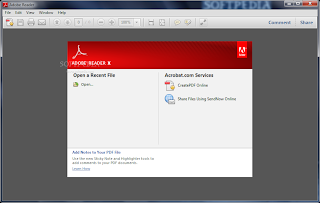 · Extend the functionality of Adobe Reader X using the Acrobat software development kit (SDK), available free of charge. · Install French, German, and Spanish simultaneously, and then switch among them using the Adobe Multilingual User Interface (MUI). The user interface also changes to the appropriate language on-the-fly. Master PDF Editor is a reliable and handy application that allows you to view and edit PDF documents. The application allows you to edit the PDF contents by adding several items, such as texts, images, check boxes, buttons and signature fields. The resulting file can be saved to PDF or image format.